Prominent & Leading Manufacturer from New Delhi, we offer aux cable. 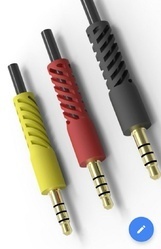 Aux cable is used in mobile phones, tablets, car stereo, home theatres, laptops, desktops, etc. it comes with different length as 1. 00 mtr. , 1. 50mtr. , 2. 00 mtr. its price for 1 mtr. Length is rs. 25/pc + tax + freight & other prices as per length required.